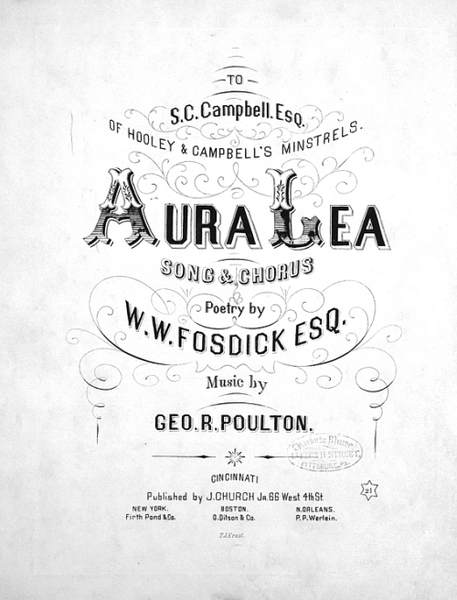 In 1861 the song Aura Lea was published and copyrighted in Cincinnati, USA. Cincinnati was the home town of the man who wrote the words to Aura Lea, William Whiteman Fosdick. But it's the tune that we are interested in, and that was composed by George R. Poulton. Poulton came from much further afield, having been born in Great Britain. His life ended in ignominy, but the melody he provided for the song Aura Lea would live on long after he died in disgrace. Anyway, back to 1861. Aura Lea was published as a minstrel tune. This was the time of the United States Civil War and the song was printed on both Union and Confederate presses, so that it became a favourite of both camps. It wasn't long before the first new set of words were applied to the music: in 1865 a version called Army Blue was used as a graduation song at the West Point military academy. Other versions followed, using different words to Poulton's tune. These included Nora Lee and Allan Sherman's polio-inspired parody in his Shticks of One and Half a Dozen of the Other medley. Even Elvis sang a version with different lyrics, this time called Violet. Strangely, despite the popularity of Aura Lea, it seems not to have been successfully recorded commercially until 1937, when The Shelton Brothers took the honours (a trial recording was made in September 1913 by vocalist R. M. Buckley for Victor in Camden, NJ, but was never released). Frances Farmer performed the song in the 1936 film Come And Get It!, but seems not to have made a recording. Army Blue, on the other hand, was preserved in wax at a much earlier date, when The American Quartet made a recording of the number in late 1913. So, although the song known as Aura Lea might be regarded as the number on which Love Me Tender was based, it's really the melody that counts, and the melody of Aura Lea was first recorded in 1913 as Army Blue by The American Quartet. Their version must therefore be regarded as the original recorded version.